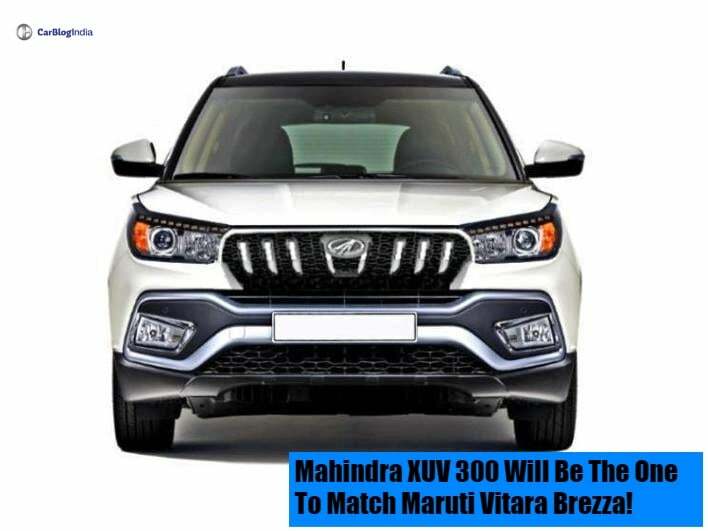 Mahindra XUV 300 will be the one to match Maruti Vitara Brezza- Here is the reason why! Mahindra XUV 300 sub-compact SUV is likely to launch in India during the month of October this year. Here are 5 reasons why it is going to be a tough contender for Maruti Suzuki Vitara Brezza. Soon, buyers in the sub-compact SUV segment are going to be spoilt for choices more than what they already are. Mahindra and Mahindra are going to introduce their offering in this highly lucrative segment this October. Based on the SsangYong Tivoli and likely to be named as the XUV 300, this new vehicle from the homegrown automaker looks to have all that it needs to real in the reigns of the current segment leader Maruti Suzuki Vitara Brezza. The Vitara Brezza has been the unprecedented leader in the sub-4-meter utility vehicle segment in our country. In fact, due to the large sales of the Vitara Brezza, Maruti Suzuki was able to beat Mahindra last year and emerge as the leader in the utility vehicle sales in India. To get its crown back one and for all as well as to reap the benefits of this highly lucrative segment, Mahindra is now going to launch the highly anticipated XUV 300 in our country. As mentioned before, this new utility vehicle from Mahindra is based on the SsangYong Tivoli compact SUV. It uses the same platform, same mechanicals and an almost similar design language to the latter. That said, when launched, it will have certain design tweaks to make it look like a Mahindra, both inside and out. Similarly, the powertrains will be from the house of Mahindra as well. Buyers in the compact SUV segment want a vehicle which is youthful, is practical, is frugal and also, offer a decent kit as well. And the Mahindra XUV 300 has a chance to excel over its competition in each of these fields. Carrying forward the basic design layout of the Tivoli, the XUV 300 is going to get a very modern and crisp exterior design. On the interior front, this utility vehicle is likely to offer plush interiors. Mahindra has started pampering its cars with a premium touch starting with the XUV 500’s recent facelift and it has promises to give a similar treatment to the Marazzo as well which is set to launch in India on the 3rd of September this year. Talking about the features, the Mahindra XUV 300 is expected to offer all the industry standard equipment and then some more. But as we have seen with the response recieved for the Tata Nexon, due to its unique styling and contemporary interiors, the XUV 300 will have an edge over the Vitara Brezza, particularly in the interior layout department. Another area where this new SUV from Mahindra has a chance to excel is the engine department. The Maruti Suzuki Vitara Brezza so far only comes with a diesel derivative. The XUV 300 or the S201 (codename) is expected to offer both petrol as well as diesel powertrains. Media reports suggest that this SUV is going to offer a 1.2-litre petrol engine and a 1.5-litre diesel motor. The power outputs speculated for these engines is around 100 BHP. Hence giving a slight edge of the Vitara Brezza. Both manual and automatic transmission options will be on offer.